It might not show in pictures, but I've always been sort of a laid-back personality. Sure, I'm super Type-A, but that's mostly when it comes to things like accomplishing my own, personal goals. Okay, so that's a long buildup for what I'm about to say: I got no beef with that little Rebecca Black song. "Friday" is all about pure joy, man, and I just don't understand the hate. Now get over yourself, and listen to me. Yes, the words are inane and the the vocoder on her voice makes her sound like a tree frog, but when you get right down to it, "Everybody's lookin forward to the weekend." That's something we can all understand. Right? It's so simple, it's corny. Anyway, I got to thinking about writing and the book I've currently got on submission. When I started writing that one, I had one thing in my head: Keep it Simple. I'd recently re-heard that This American Life broadcast where Starlee Kine wanted to write a break-up song, so she enlisted the help of Phil Collins. I don't know if you've heard it, but it's gut-wrenching. Here's the (link). Anyway, I always thought Phil Collins was a tool and his music was oppressive. But after listening to that TAL, I decided he was among the first people I was inviting to The Party. After Shatner and Bill Murray and Kirstie Ally. And Wes Anderson. And my little sister, Reese Witherspoon. Yes, this is a fictitious party in my head. So? Here's my point: Last week (or so) I posted about writing a classic, and we all weighed in. The comments basically added up to the fact that a classic presents relatable characters going through situations we all face in an engaging, timeless way. I'm not saying "Friday" by Rebecca Black is a classic. But I think it deserves examination. It doesn't over-think the situation. It boils it all down to the basics. I'm snorting as I say this, but it's primal. And it's damn catchy. The lesson I got: Do that logline exercise described by Nathan, Rachel and now Natalie. Then start writing. 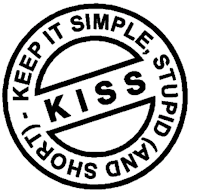 Keep It Simple, Sweetheart (KISS). Okay, I'm just throwing it out there. What do you guys think? Have I lost it this time? Remember, LITBM blogfest is Monday! Here's the (link). Now, I'm going to have that stupid song in my head all day. Thanks for that. My daughter recorded it from glee the other night, and laughed and laughed. At least the girl got some laughs from it. I appreciate someone who goes after what they want in life. I wouldn't mind, but her voice...it's so flat...!! But but but! I like even less the hatred thrown at her because I just see a young girl (not woman, a girl and my deeply imbedded maternal instincts are on high alert!!!) being picked on and bullied and I don;t go with that. But but but again!! I do like your "keep it simple" advice too!! As someone who has a natural tendency to toss backstory and plot complications in too heavily while drafting only to chop them out in revision, I gotta say "thanks!" The biggest pull of the story is indeed the emotional "throughline," not all the bumps along the road. Yes, the song is... but it does have it's place I suppose. 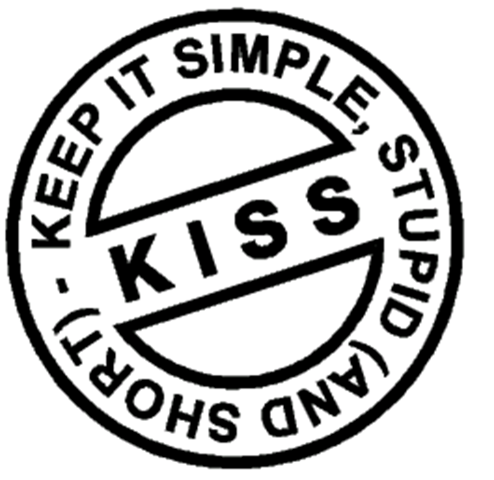 I LOVE the "Keep it simple" slogan. That's what I did in my second novel after the first was soooooo wordy and it took me eighteen months to slim it down. IT's all part of learning ... right? Good slogan. I haven't listened to the songs- but I'm not that much of a song person. specially at 7:30 in the morning. My brother put this song on our road trip playlist. We heard it approx 30 times in a two day period. Now Cade walks around singing it. Keep it simple is great. Can't wait for you to get your novel sold. ). LOL. ps: love the song, too. It's a lot of fun. Blogger's still acting up a bit. I'm having to wait and wait for blogs to open up. Simple (which isn't simple at all) works. But you use great verbs and know how to be evocative. Leigh, we're always gonna be 'home.' It's in our blood. When I saw Krotz Springs in the flood zone, I shivered. Seriously! Nothing to do but get out and gut it out. Soooo sad! I totally had to go listen to the song. I'd never heard it. Talk about getting to the basics. :) I probably wouldn't listen to it all the time, but I laugh to think there's a backlash. KISS is a great thing to remember. That song's really terrible, but it is what it is. And it's actually very Up! :D Or maybe I'm just a mom now. LOL! Glad you could weigh in~ <3 ((hugs)) here's to persistence! Spot on! I try to focus on what my character wants and who is going to stand in her way. I need to boil it down to the basics or I get lost on the way. I don't know that song! Should I consider myself lucky? I don't like singing tree frogs! I love that you can appreciate the Friday song and I was delighted to see it covered by Glee as well. The poor girl was getting death threats which is silly. You aren't nuts. I'm reviewing my WIP and realizing it's convoluted because it's too complicated. I was throwing in too much stuff. Stripping it down to the basics and then layering in things that fit the simple premise will help me a lot. P.S. love your party guest list. You lost it a loooong time ago, sweetie. ;-) I think Friday is catchy little tune. I do prefer the Colbert version (that one was the BEST). I hadn't seen the Glee version. Personally, I give Rebecca props for even putting that song out there - that takes incredible courage. The same amount of courage it takes us to hit send on that query letter. I don't get all the hate either. It's just a SONG. I think you're rocking the casbah w/this epiphany. And I like the KISS anagram. VERY easy to remember. DId you make that up? AWESOME. Also, I must give props to Rebecca for dealing with the boneheads that have harassed her so much. I'd like to see them record a song! I've also been working on a story, and I've started it over twice because my main character (a teenage girl) seemed a lot like a Mary Sue (predictable, damsel in distress, no originality whatsoever) and that was the opposite of what I wanted for her. So I just stopped thinking too hard about it and let it happen. Now, I feel more at ease with my character and story. I just wanted the story to be fun and relatable---like Rebecca's song. Hopefully, it'll turn out that way. PS-Sorry for my essay comment that doesn't make much sense. I'm half-awake right now! Friday is the first song I've really liked since like 1999. I'm serious. I agree with you, stop the hatting on Rebecca. I think that this was a fun project that her parents sponsored for her to have one of her dreams come true... don't think that any of them took it as seriously as everyone else seems to have. They probably never anticipated her to get so much publicity over this weekend project.